Brand new style meets all-around use in this beautiful piece from Kraus. This single-control faucet has a timeless design that looks great in any bathroom. This item's deck mounted design is easy to set up so you can enjoy a finished counter top. This WaterSense certified faucet uses less water but gives you the same clean every time. Make your bathroom look like new with this chic, useful piece from Delta. This single-control faucet gives off a modern feel and looks great in any bathroom. Make your sink look even more beautiful with this item's easy-to-install deck mounted design. This WaterSense certified faucet helps save water, money, and the environment. Seda Single Hole 1-Handle Mid Arc Bathroom Faucet in Chrome with Lever Handle Brand new style meets all-around use in this beautiful piece from Kraus. This single-control faucet has a timeless design that looks great in any bathroom. This item's deck mounted design is easy to set up so you can enjoy a finished counter top. This WaterSense certified faucet uses less water but gives you the same clean every time. Seda Single Hole 1-Handle Mid Arc Bathroom Faucet in Chrome with Lever Handle is rated 4.8 out of 5 by 17. Rated 4 out of 5 by dawn from great lookiing faucet Jusst installed it today. Love the way it looks. just wish it had come with plugs for the faucet holes. Rated 5 out of 5 by Peter from High quality components. Easy to install. Looks great.... High quality components. Easy to install. Looks great. Rated 5 out of 5 by MK from High quality....I love it!... High quality....I love it! Rated 5 out of 5 by Mike from The Seda Single Hole Single-Handle Chrome/White Faucet is very elegant and functions smoothly. ... 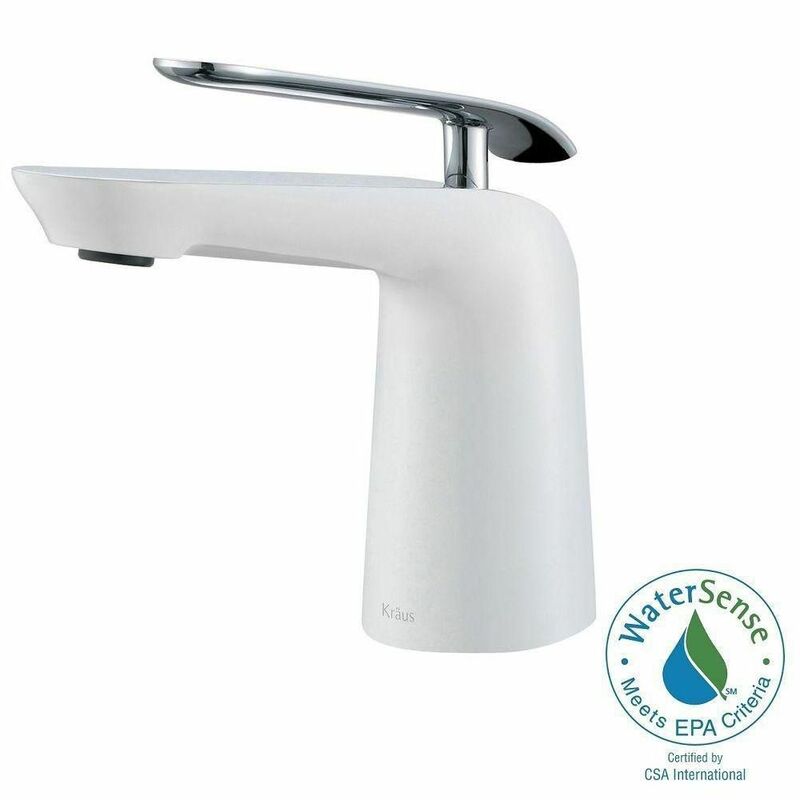 The Seda Single Hole Single-Handle Chrome/White Faucet is very elegant and functions smoothly. The white underneath matches the porcelain vessel sink and with the mirror behind it it accentuates the Chrome finish, making it a very stunning faucet for my bathroom. The compliments received have been great, though have been asked a few times if it came with the vanity, unfortunately it didn't, as that would have been a great buy. Was very please to locate a perfect compliment to the Bailey 24" Wenge cabinet recently installed. The design that went into the packaging was thoroughly thought out keeping the product secure and undamaged. I would highly recommend this product to anyone looking to install or replace their existing faucet. A small recommendation, would be to change the included sink drain from a pull stick to a pop-up drain. Prefer a pop-up drain preventing the need to install the pull handle, thus ordered a matching companion from Kraus. Rated 5 out of 5 by Cbcbrewer from Bathroom faucet Beautiful faucet.....Superior finish and operation. Easy installation.